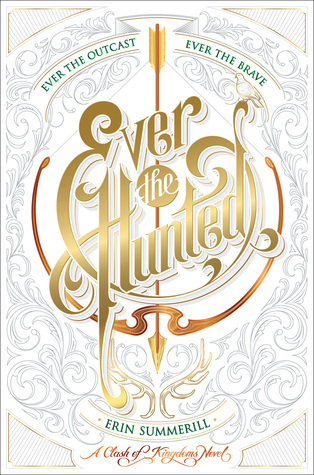 Ever the Hunted was a book I had been looking forward to for quite some time. The premise of the story seemed so interesting and that cover... WOW! I always get a little nervous to read a book when I've been looking forward to it for so long. I tend to work it up in my mind and set pretty high expectations, but no worries here because Ever the Hunted did not disappoint. Summerill did a phenomenal job building Britta's world and I loved the idea of a kingdom that believed in magic and one that shunned it. The story was fast paced from start to finish and the more I learned about the world and the characters, the harder it was to put the book down. I've read a few reviews that did not like the romance in the novel, but I quite liked it. I do typically like a little romance in a novel, but I think Summerill did a wonderful job of adding just the right amount. I also really enjoyed Britta's character. She is tough, smart, and not the average damsel in distress. I have a tendency of becoming easily annoyed with characters, but she was wonderful and easy to like. Ever the Hunted was an intriguing story and I can't wait to read the remaining books in the series. The novel was fast paced, full of excitement, and I thoroughly enjoyed it. I will definitely be recommending this book to all of my YA loving friends.